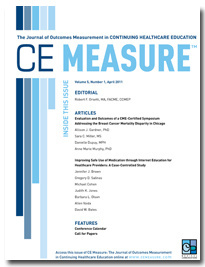 Home > Carden Jennings Publishing Co., Ltd.
CE Measure is the first peer-reviewed journal dedicated specifically to the art and science of healthcare educational outcomes measurement. Original manuscripts that address outcomes methodologies, results, practice-based protocols, CE conference highlights and abstracts, and case histories will be published to promote vigorous academic scrutiny of this important subject. With its Editor, Bob Orsetti, a 30+ year CME veteran who has served on nearly every influential committee and task force addressing the future of CME, and an editorial board of undisputed leaders from academia, industry, clinical fields and societies, and commercial educational companies, CE Measure is a driving force in outcomes measurement and analysis. Volume 10, Issue 1 is now available. Make a lasting contribution to the emerging field of healthcare educational outcomes measurement by submitting a manuscript to CE Measure. Your opinions and perspectives can shape the future of CME. Learn more. CE Measure seeks organizations interested in supporting unbiased research and educational practices. Learn more about opportunities to align your organization with this important initiative. 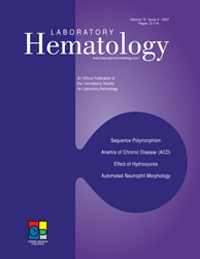 Laboratory Hematology, an official publication of the International Society for Laboratory Hematology published by Carden Jennings Publishing Co., Ltd., is dedicated to the publication of high-quality reports of original research, reviews, editorials, and letters to the editor in all fields of laboratory hematology. Emphasis is placed on manuscripts dealing with both practical and theoretical aspects of clinical laboratory hematology, including routine and special hematology, coagulation, transfusion medicine, immunology, molecular biology, marrow and cell transplantation, instrumentation, and urinalysis. Volume 19, Issue 1 is now available. Carden Jennings Publishing Co. Ltd.